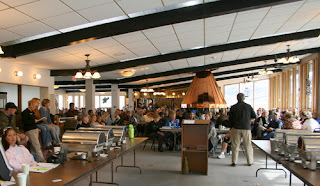 The Sunset Grille is packed today as almost all our seasonal employees and managers are on hand for orientation. This is the day where we introduce new employees to the mountain and talk about policies, guest services, start training, etc. It means that ski season is almost here! Now if Mother Nature would just cooperate we'd be all set. It looks like this Sunday the jet stream is going to sink down into Arizona and New Mexico which is exactly what we want to see. Lows for the Grand Mesa are forecasted to be zero to 10 degrees. Perfect for making snow. I know some of you are getting antsy and worried. We still plan to open December 6th. It's too early to tell if that would need to change. A Thanksgiving storm should help us out a lot. So it's not time to worry yet! Of course I will let you know as it develops here on the mountain. This will be the first place to see snowmaking pictures and both natural/man-made accumulations. Once we figure out how to use the video camera and edit, we'll get video up on the site as well. Welcome all 2007-08 Powderhorn employees!